At just eight years old, Caryn and her siblings were whisked away from their Baltimore row house with no warning or chance to say goodbye to their father. That Amber-alert worthy experience was the first of many challenges that threatened this columnist and author’s emotional foundation. In Bitter or Better, Caryn recounts how she spent years juggling one health crisis after another, avoiding emotions and focusing on solutions. But when, days before Christmas in 2009, her husband’s heart attack changed her “W” from “wife” to “widow,” her familiar coping mechanisms began to fail her. Determined to set a good example for her children, Caryn chose better. Drawing inspiration from people who had also dealt with adversity, she created a roadmap to resilience that became the framework for her award-winning memoir. Her candid account of her journey from angst to acceptance of her son’s autism will both inform and inspire readers, as will her account of her daughter’s bone marrow transplant – a terrifying experience that came on the heels of Caryn’s cancer battle. 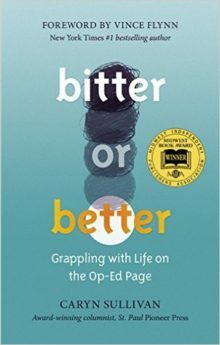 Bitter or Better takes readers through joy and heartache, offering hope and inspiration by blending Caryn’s personal stories with notables who inspire her, among them Temple Grandin, Louise Fraser, Vince Flynn, and Bob Woodruff. The lessons in Bitter or Better illustrate how choosing better over bitter not only impacts our lives, but also our legacies.